The tip of Newfoundland's Northern Peninsula hosts these sea-jewels for a few months each year. From May through July, Iceberg Alley sees as many as one thousand icebergs trickle past the East coast of Newfoundland and Labrador. Floating glaciers. Giant ice cubes. Fresh water frozen and sculpted in a thousand shapes and sizes. Icebergs. These sparkling towers of ice dot Newfoundland and Labrador's eastern waters in late spring - May through July - each year. 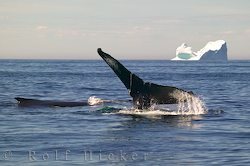 Born from Greenland glaciers, icebergs arrive in Newfoundland waters after a two year trip, but the life of an iceberg began some 10 to 15 thousand years ago. As snow fell in Greenland, it compacted over the centuries to form huge glaciers extending from mountain to sea. Gravity and spring melt water bring these glaciers to the coast, hanging over the cliffs into the sea. Each spring, thousands of pieces of ice break into the ocean from these glaciers. This is called calving, and is where an iceberg's journey begins. 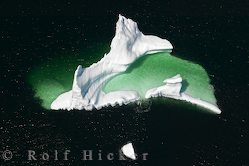 Icebergs spend their first spring and summer traveling North in the ocean current towards Baffin Bay. Come winter, they freeze amid the pack ice (sea ice) that forms in the North. There, they wait out the winter months until spring breakup releases them from their icy time out. This spring, the ice will move south with the Labrador Current, along the East coast of Baffin Island towards the Davis Straits. Here, they freeze again, spending the long winter months trapped in the pack ice North of Labrador. Spring arrives once more, and most icebergs begin their final trip South through Iceberg Alley. Pack ice and a frozen sea are not the only obstacles in the way. The ocean floor is not flat. Hills and valleys create a rugged underwater terrain. These hills are called shoals. Large icebergs can touch bottom in these areas, and become grounded. An iceberg can be stuck on a shoal for many weeks, only moving on if it melts enough to lift itself off the bottom, or if it cracks and re-balances itself with less underwater depth. The tide or ocean currents will then carry the berg farther South. Other bergs are not so lucky. Some remain trapped in bays and coves, grounded beyond rescue of a swift current. 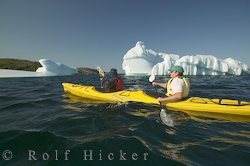 Most icebergs that make it to Newfoundland waters (about 1000 each year) will melt and break apart in bays and coves on the East coast. A few hardy bergs will make it to Southern Newfoundland and continue on past St. John's, but when the Labrador Current meets the Gulf Stream, an iceberg doesn't have many days left. These giant ice pops can take up to 100 thousand years to reach the sea, but just two months to melt off the shores of Newfoundland. The wind plays a very small role in an iceberg's migration. Just 1 eighth of an iceberg's mass is above the waterline. An iceberg that soars 25 meters (83 ft.) above the waterline can extend for more than 100 meters (333 ft.) below, and so the main sail of an iceberg is underwater, where ocean currents bandy the berg about. Icebergs don't all come in the same size or shape. 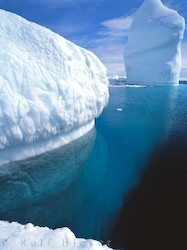 The portion visible above water will classify a berg as a bergy bit, a growler, or a true iceberg. A bergy bit is any piece of glacier ice the size of a fist to the size of a car. A growler measures to the size of a school bus. A true iceberg begins at the size of a small house. Icebergs can be blocky, tabular, or wedge-shaped. Some have pinnacles while others have towers or arches. Like the snowflakes that made them, no two are alike. Though the change is not always visible, icebergs are morphing constantly. Ocean currents shape the underside, while wind and waves carve the ice above water. The ocean floor can also shape a large berg, as the berg drags across the bottom. On the surface, the sun's heat will melt a berg, while light weakens the ice, making it prone to cracks and fractures. Big changes come when these cracks and fractures give way and the iceberg breaks, losing huge chunks of ice and thousands of tons in just a few seconds. This is called foundering. The berg will be thrown off-balance, and may roll over or lean to one side to compensate for the lost weight. There is usually no warning save for an earsplitting crack just before an iceberg founders. The berg can break or roll in a matter of seconds. For this reason, boats shouldn't venture too close to these mountains of unstable ice. Icebergs appear mostly white because of the properties of light reflection. The more air trapped in a berg, the whiter it will be thanks to the thousands of air bubbles that were trapped between each snowflake as the snow fell in Greenland thousands of years ago. Blue streaks in bergs are common, this is where melt water in Greenland ran into cracks and crevasses of the glaciers and re-froze. There are very few air bubbles here, hence the blue coloring. Sometimes icebergs look dirty, or have lines of black and brown running through them. This is sand and dirt that a berg carried from Greenland. Any exposed soil or silt can get picked up by running water and re-freeze in glacier cracks, just as those blue lines are formed. Be careful not to confuse pack ice with iceberg ice! Pack ice is frozen seawater. The naked eye can't tell the difference, but your taste buds can, and will, if you drop a chunk of sea ice in your drink. Having been born from a glacier, the ice of an iceberg is under a huge amount of pressure. As it melts, the ice "pops" as the air bubbles are released. This air has been trapped for more than 10 thousand years! Iceberg ice is so dense that seawater doesn't contaminate it. Melted iceberg ice is some of the purest water in the world, having been frozen long before the industrial revolution, long before pollution ruled the planet. The Viking trail will bring you to the heart of iceberg country. From St Anthony, on the Northern tip of Newfoundland, Northland Discovery Boat Tours operates iceberg tours beginning mid May. Meet the icebergs from on board a 42-ft vessel, the Gaffer III. Call (709) 454-3092 or Toll free: 1-877-632-3747 or visit Northland Discovery Boat Tours for information and reservations. 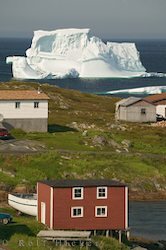 A great place to stay while exploring the northern tip of the Viking Trail is at Tuckamore Lodge situated in the town of Main Brook a hub for adventure, heritage trails, and iceberg watching. One of the very first iceberg watching companies in Newfoundland is known as Twillingate Island Boat Tours and is headed up by The Iceberg Man himself, Cecil Stockley. Tours depart from Twillingate along the Kittiwake Coast of Newfoundland. 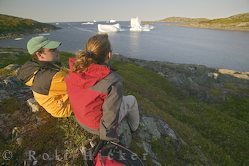 Check out the Twillingate Island Boat Tours website for more information about departures and the Iceberg Shop. Near Terra Nova National Park on Newfoundland's East coast, Ocean Watch Tours leaves the Saltons Marine Interpretation Center on board the 35-ft vessel, the M/V Northern Fulmar. Call (709) 533-6024 or visit Ocean Watch Tours for more information. Closer to St. John's, O'Brien's Boat Tours leave from Bay Bulls on one of two 46-ft vessels. Call (709) 753-4850 or visit O'Brien's Boat Tours.